Thanks to my loyal customers, my time is more in demand than ever. For scheduling purposes, only requests for ongoing blog posts and e-mail newsletters are being accepted at present. I am already fully booked through mid-June of this year and the summer months are quickly filling up. What’s so special about this business anniversary? I haven’t been in business 150 years like some corporations or even 5 decades like other companies. So what makes my business anniversary special? It’s you—my client. 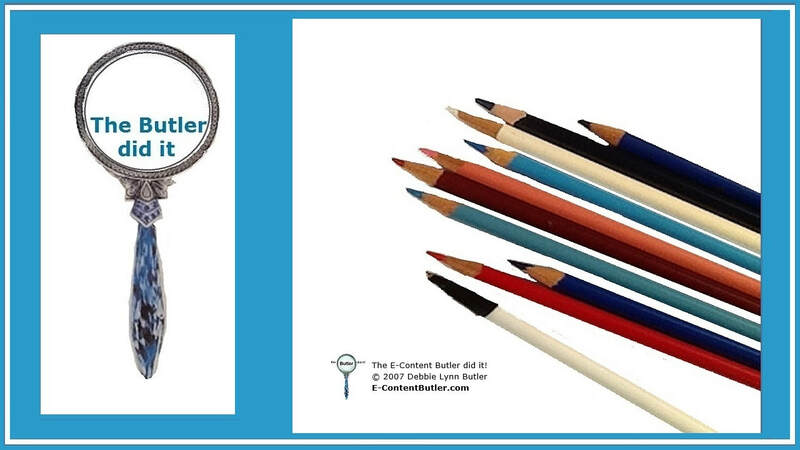 Each and every client has contributed to the E-Content Butler story. Your field of expertise—often so different from my own—makes my work more interesting. Your questions keep me at the top of my game. How you do business has helped me clearly articulate my values. Current and prospective customers also provide the impetus to explore new trends and technologies. Although the writing process hasn’t changed in my 12+ years in business, the process of sharing your words continues to evolve at a rapid rate. Last but not least, I am thankful that business acquaintances and clients have become friends over the years. Thank you so very much. May your business also thrive and may you celebrate a wealth of milestones and business anniversaries of your own. It’s your story but it’s my mission to help you tell it well. 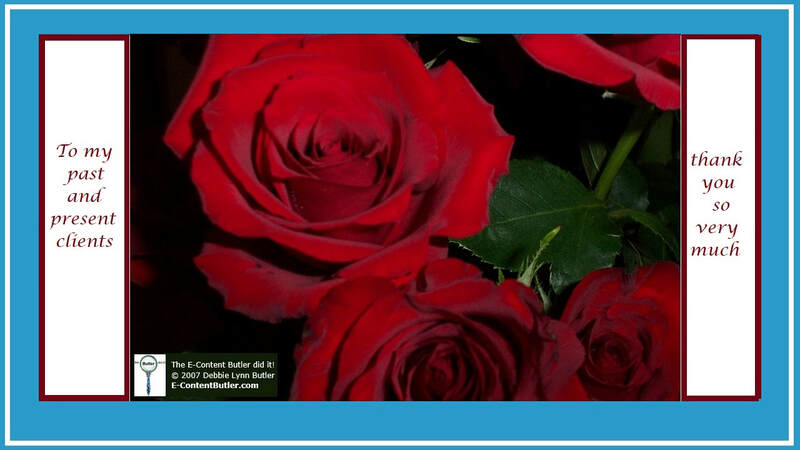 This E-Content Butler checklist will get you started. Are you addressing your children or heirs, family and friends, those who need your expertise, individuals facing similar circumstances as you, future generations who will need an eyewitness account of history as it was being made, complete strangers who have money to purchase your story, someone who _________ ? Tailor your writing style to your intended audience. Pick easy-to-understand words and concepts for small children. Use humor to entertain family and friends and build them up. Share your expertise in a manner suitable for where it will be published—professional journals, for instance, require a more scholarly tone than a newsletter. Choose whether you will tell your story in first person (“I” and “we”) or in third person (“she” and “he”) from a narrator’s point of view. Which format will you start with (you can expand to others later): audio recordings, blog, book in print, e-book, newsletter, series of articles, series of videos, or a Web site? There is no one-size-fits-all for storytelling—you can organize your tale alphabetically (A is for _____, B is for _____), around one common theme that is repeated multiple ways, chronologically with a timeline, numerically (1. ___ 2. ___ 3. ___), ordinally (First ___. Secondly ____. Thirdly ___. ), or sequentially—this can be as simple as an introduction, text, and conclusion or as complicated as a prologue, multiple chapters with subheadings or plot twists, and an epilogue. Like your voice, the presentation of your story should also appeal to your chosen audience. Things to consider include accessibility for those with audio and visual challenges; a coherent color scheme for branding, images, and any online presence; font size and font style; how you will handle captions, credits, footnotes, references; how much white space you want to include in your presentation; placement and number of images; and whether your storytelling will be playful, professional, or somewhere in between. This includes facts, figures, photographs and other images, quotes, source and copyright information, and written permission to use all of the above if they are not your own. The more writing you do, the easier it gets (as the E-Content Butler, I speak from experience) so mark your calendar now. You have a unique story to tell. Let’s get started. I take great delight in beautiful gardens but find little pleasure in planting, weeding, and other upkeep that only seems to encourage the rabbits and deer to feast in my yard. That’s why I am such a fan of gardens done for me (and other visitors). all without having to give it any thought. Are you tired of creating all your content yourself? Contact me about content done for you. “Consider how the wild flowers grow. They do not labor or spin. 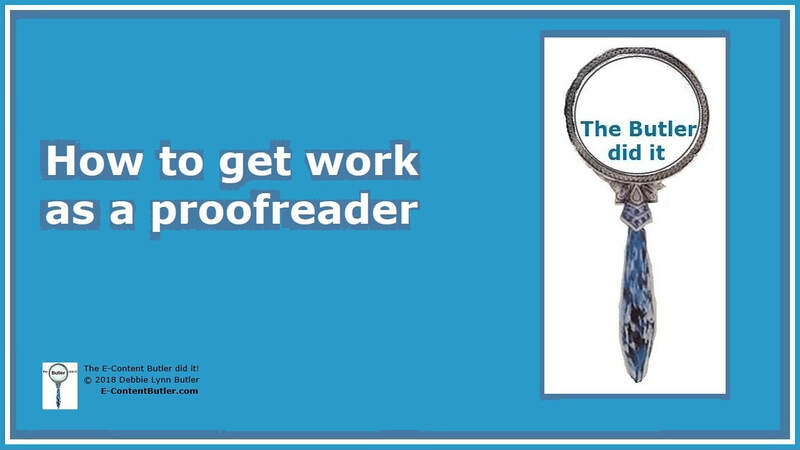 How can I get work as a proofreader? “Are you hiring?” and “How do I get a job as a proofreader?” are two of my more frequently asked questions. I am not hiring. However, I can offer these tips. Anyone can use a spellchecker and point out other people’s mistakes. A good proofreader, like an editor, can explain how and why something should be changed. This involves grammar, spelling, subject/verb agreement, overly repetitious phrasing, good and better word choices, and so much more. If you truly like proofreading, editing, or both, become a freelancer or start your own business. Good proofreaders are hard to find and your services will always be in demand. If you are a morning person, set aside those morning hours for proofreading. If you function better at night, proofread at night. You will be more accurate and productive than trying to proofread an entire 8-hour day. Use the remaining hours of your day to build and run your business or learn something new. It’s much easier to proofread fresh, new material than text you have read and reread because the author keeps changing it. Whenever possible, insist on the final draft before you start proofreading. Give it a try in a friendly environment. Discover your preferences. • Do you work best under pressure (I need this by lunchtime today) or with a more relaxed deadline? • What length works best for you—the quick one-pagers, the book manuscripts, or somewhere in between? • Would you choose fiction or non-fiction? • Are technical and scholarly works worth the extra time and attention they require from you? • Will you accept something that is handwritten and needs to be typed and then proofread? • What is the average time it takes you to proofread 350 words or about one page from the genres you typically find yourself proofreading? Once you know your preferences, do not try to be all things to all people. Concentrate on the kind of work that you enjoy because proofreading can be intense work. You might as well enjoy what you are reading. There are plenty of people who want a proofreader to deliver perfect work, the same day (if not earlier—if that were even possible), and for pennies. Perfection takes time and comes with a cost. Don’t sell yourself short. Say “no, I won’t proofread for you” to the person who insists someone else will do the same work for a ridiculously low sum. Otherwise, you will find yourself haggling or unpaid in the future. With time, you can establish yourself as a proofreader. I did and now I have a thriving business that includes writing, editing, and publishing for a select group of clients.